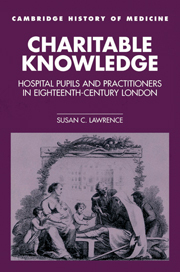 Charitable Knowledge explores the interconnections among medical teaching, medical knowledge and medical authority in eighteenth-century London. The metropolis lacked a university until the nineteenth century, so the seven major voluntary hospitals--St. Bartholomew, St. Thomas, Guy, the Westminster, St. George, the Middlesex, and the London--were crucial sites for educating surgeons, surgeon-apothecaries and visiting physicians. Lawrence explains how charity patients became teaching objects, and how hospitals became medical schools. She demonstrates that hospital practitioners gradually gained authority within an emerging medical community, transforming the old tripartite structure into a loosely unified group of de facto general practitioners dominated by hospital men. Historians of science and medicine will want to read this book. List of tables and figures; Preface; 1. Introduction: hospital medicine in eighteenth-century London; Part I. Institutions and Education: 2. The London hospitals: virtue and value; 3. The corporations, licensing and reform, 1700–1815; 4. Walking the wards: from apprentices to pupils; 5. London lecturing: public knowledge and private courses; Part II. Community and Knowledge: 6. Gentlemen scholars and clinical cases, 1700–60; 7. London hospital men and a medical community, 1760–1815; 8. Hospital men make medical knowledge, 1760–1815; Conclusion; Appendices; Notes; Index.